You might think of a podcast as a radio show that's on the Internet or as a webinar that only has sound (no video). You can also listen on your phone using a podcast app. iPhones have a built-in app called "Podcasts." You can also listed on the Google Play app and on Stitcher. How Do You Subscribe (and Why)? 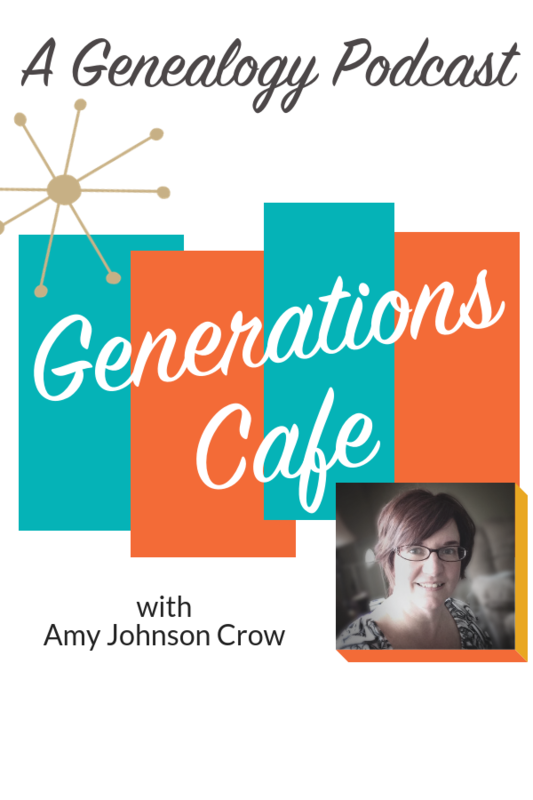 You can subscribe to Generations Cafe using the Apple Podcasts, Google Play, or Stitcher apps. It is free to subscribe! When you subscribe, you'll be notified when a new episode is available. What Happens to the Blog? Is It Going Away? The blog is staying right here. Each episode of Generations Cafe will have its own blog post. You can read the post and/or listen. Your choice! 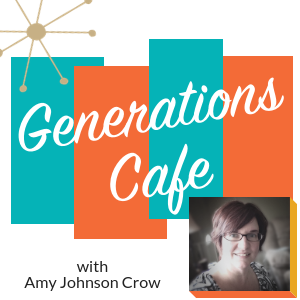 Where Did the Name Generations Cafe Come From? You'll have to listen to Episode 1 to find that out. Ep. 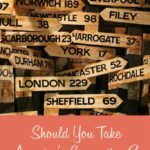 1: Is Perfectionism Ruining Your Genealogy? You can also click here to get links to all of the episodes and show notes. 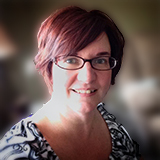 This entry was posted in Announcements, Podcast and tagged Generations Cafe by Amy Johnson Crow. Bookmark the permalink. I just subscribed on my phone so I can listen and learn during my daily commute! After the title of the podcast can you put the minutes? Sometimes 15 minutes is easier to schedule. Do you mean here on the website? That’s a good idea. Thanks! 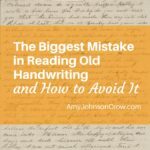 You brought up many great points in this first episode, “Is Perfectionism Ruining Your Genealogy?”. When you read the errata, additions, and/or corrections published by reputible authors of major family history projects, it becomes clear a perfect family tree is unattainable. Transposition errors happen. New discoveries are made. DNA testing disproves a long-held assumption. There are many reasons. The brass ring of a “perfect” family tree may be a little tarnished, but it is much more than we had before we started. I like this idea. 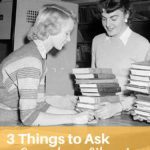 Do you do reviews of authors who write about genealogical research? I’ve done a few book reviews, if that’s what you mean. Please count me in! I’d like to register, but won’t use my phone. I understand it’s on this website, please correct me if I’m wrong. Yes, you can listen to each episode here on the website (and you don’t need to use your phone). Just click the play button to listen! The first 3 episodes are listed above. Just listened to all three of the podcasts, they are great and full of things that we all should think about doing in our research to make ourselves a more proficient researcher! Hi, Jim! Glad you’re enjoying the podcast! I’m working on a page devoted just to the podcast, which should make sharing easier. In the meantime, you can share the link to specific show notes on Facebook. If you’re listening on the Apple Podcasts app, you can tap the 3 dots in the lower-right corner and tap “Share.” That lets you send it as a message, post on FB, etc. Thanks for sharing! Thank you for also making the podcast available as a transcript! due to hearing issues it is so much easier for me to read than listen. Great listening to your short and informative podcasts on Stitcher. Transcripts are equally appreciated.